Everynow and then I stop and ask myself the question Do I enrich the lives of others, and then I think on it. As we approach Thanksgiving it reminds me how much I have to be grateful for and how blessed I am to be able to share the work that I love in such a meaningful way. Last night I was reading some of the customer reviews that have been posted on Amazon for my books, in particular the new book Needle Painting Embroidery: Fresh Ideas For Beginners and the warm feeling it gave me to see this appreciation expressed. There are also several online sites & blogs who share and review my work and as it is not possible to respond to each person individually, I hope that you will read this post and accept my thanks for taking the time and trouble to view your ideas, it really is much appreciated! My thanksgiving gift to you is a list of ten hints for smoother shading that I have compiled over the years and hope they will benefit those of you who are battling in this area. First Row. Is your first row of shading full and close together? If there are gaps between the stitches then the stitches in the next rows will look too sparse and this will leave little holes in the shading. The stitches in the first row should be dense but not overlapping each other. Don’t make the stitches in the first row too short you need plenty of room to work back into. Needle Placement. Check to make sure that you are bringing your needle UP through the stitches of the previous row and not down into the stitches. If you go down into the stitches it will create little holes which makes your stitching look rough. Staggered lines. Are you staggering the stitches in each row? The stitches in each row should not be in straight lines or they will cause hard bands of shading. You can take some of your stitches right back into the previous row and bring some further forward to create a staggered effect. Right shades. Are you using the right shades of thread for your blending? Each shade blends into the next creating a soft transition of colour. If you skip a shade or change tones abruptly it will not blend correctly. Guidelines. Are you keeping in line with your pencil guidelines? It helps to draw in guidelines before you start stitching – these will direct your shading to fit the shape. Curved shapes. Stitches can only be straight. To get your stitches to fit a curved shape you may need to shorten your stitches slightly and stitch more than one row of each shade. This will help your stitching to gently move around the curve. Adjusting to fit curve. If the stitches in the first row start to curve across the row you will need to add in a little wedge stitch to help change the direction of the stitches. If you change direction in the middle of a row your stitches will look untidy. Path of stitching. Are you stitching from the wider part of the shape towards the narrow part. It is very difficult to add on stitches but it is easier to reduce the number of stitches as you move down. Daylight. Are you working in a good light? A magnifying light is essential for this type of work – you will not be able to see the details and your stitches will be all over the place. Tension. Is your fabric stretched drum tight across your hoop or frame? If it is loose in the frame you will not get a good tension which will result in uneven stitching. You need to adjust your fabric periodically to ensure it is drum tight at all times. Thank you for these hints. I shall look forward to challenging myself with one of your beautiful kits before year end. Request for a bit of help; on the Purple Bearded Iris on pg. 100 in Long and Short Stitch Embroidery. In pondering your list especially number 4, I think I cornered my problem. Is it possible that R= light purple is not number 3836 but rather 554 ? And S = medium light purple is not 554 but is 3836 a dull light purple? I had filled in petal number 4 with colors from light purple to very dark blue. Looking closely I was happy with the stitch direction. However at a distance there were no distinctive ripples of color that make the petal look dimensional. The edge looked too dark. i thought adding in some highlights with light purple wold do the trick. No go, flat petal. So I took out the stitching. It would have helped if I had taken a look at it from a distance before going to the third color! I am still determined to finish this beautiful piece. Thank you very much for your tips. I am sure that will help me how to understand better the way of shading. 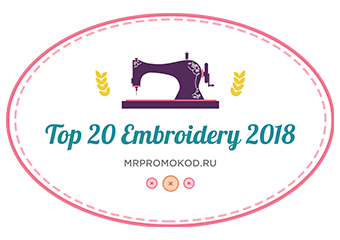 That will help me also with the other embroidery ” bunka ” and I will practice with your free download pansies, I am looking near by for your new book for beginners. I will buy it as soon it will be available. Many thanks for this – it seems that it will be very helpful. I don’t actually embroider in the way you do, mostly I embroider on crazy quilting. But I often use motifs similar to some of yours and I am finding the shading a bit problematic. So thanks again. Thank you very much! I have been working on a beautiful purple iris from one of your previous books. I think hints 4,5,& 6 are the key to what is bogging me down. I got to a point where I was taking out more stitches than I was putting in and was about to put it aside as a ufo for some time. I’m thinking now that adding more guide lines, making sure not to skip a shade and adding a second row of the same color at the curves with shorter stitches will answer and correct my troubles. Thanks so much! I am working on exactly this problem with the wild rose from your Beginners book. 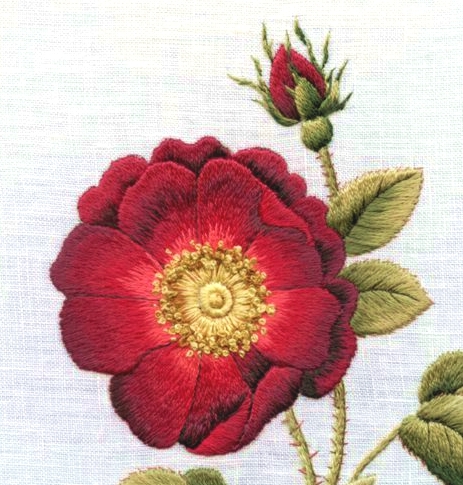 I posted about my progress here http://enbrouderie.com/2011/10/21/update-trish-burr-wild-rose/. I’m learning a lot, and really enjoying myself. Thank you so much for sharing these important hints with us. Thanks so much by these wonderful hints!! Thank you for the tip on coming UP rather than down into the stitches. No wonder I was not happy with my long and short stitching. I am so grateful that we have a teacher like you. My best gift Mike gave me this year was my course with you this October in Johannesburg and I truely hope that this is the beginning of many courses that I will attend. I just oohed and ahhed over your flower as soon as I saw it. Your suggestions are most helpful and you should not wonder if you are helping others or contributing to the welfare of others.